France and Italy unveiled plans on Monday (27 October) to trim their deficits more than previously planned in last-minute pitches to get clemency from the European Commission on their 2015 budgets. The European Union’s executive arm has until Wednesday to decide whether to reject France and Italy’s 2015 draft budgets for failing to make sufficiently large improvements in their public finances. The two countries had so far defied pressure from Brussels and Berlin to rein in their public finances faster over concerns that more belt-tightening could throttle their already fragile economies. But in separate gestures to Brussels, Italy said it would make additional deficit cuts worth €4.5 billion next year and France followed suit, saying it would trim by an extra €3.6-3.7 billion. The finance ministers of both countries laid out their cases for Brussels’ clemency in letters on Monday to Economic and Monetary Affairs Commissioner Jyrki Katainen. A spokesman for Katainen said the Commission welcomed Italy’s “constructive feedback”, but that discussions remained ongoing and “the outcome of this process remains open.” The Commission later said there was nothing else to add about France. In Italy’s case, the measures include scrapping some €3.3 billion of planned tax cuts, according to Finance Minister Pier Carlo Padoan’s letter. The changes follow a request from the Commission for action after the budget pushed back promised debt reduction targets. It remains to be seen whether the amendments satisfy Brussels. 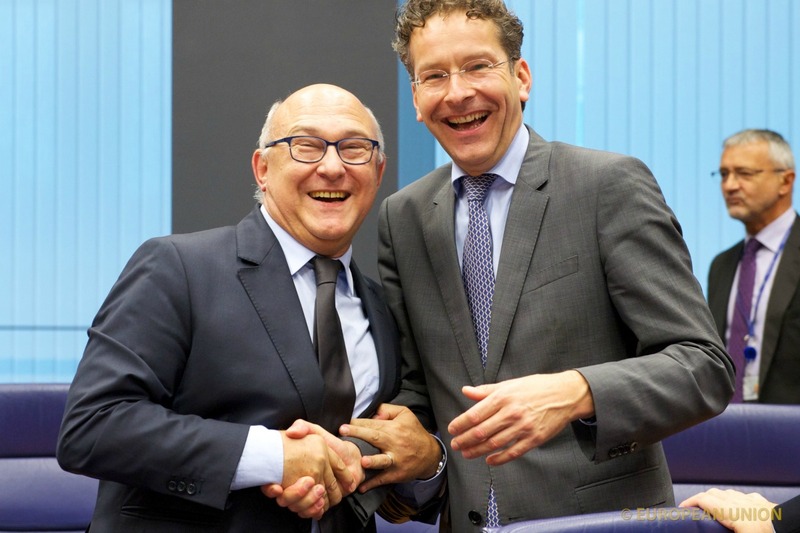 As for France, Finance Minister Michel Sapin said that the additional resources come from lower-than-expected costs on interest payments and contributions to the European Union’s budget, which with other cost savings are worth some €1.5 billion. Additionally, €900 million in extra revenues were expected from cracking down on tax fraud while ending a range of tax deductions some companies have been able to benefit from would yield a further €500 million. Other minor fiscal measures were also planned. Together, the cost-savings and extra measures should allow France to reduce its structural deficit, which excludes the impact of business cycle and is closely watched in Brussels, by more than 0.5 percentage points of GDP, Sapin said. Under the original draft budget presented at the start of the month, the structural deficit was to be trimmed by 0.2 percentage points. The government is banking on Brussels taking an understanding view of the poor economic climate and focus on the structural deficit effort rather than the headline public deficit, which will still overshoot the EU’s 3% of output target. “France is presenting clarifications and details that will allow us to stay on track, using the flexibility that is necessary in the current deteriorated economic situation,” Sapin told news agencies. Analysts reacted with some scepticism to France’s announcements. “These are cosmetic changes aimed at responding to the Commission’s demands with as little as possible. We might have 4.1% of (headline) deficit instead of 4.3% but we won’t be at 3%,” said Aurel BGC brokers economist Jean-Louis Mourier. The French government expects growth will accelerate to only 1% next year from 0.4% this year as the euro zone’s second-biggest economy struggles to mount a convincing recovery. Italy’s economy is in even worse shape. The Italian government expects the euro zone’s third largest economy will grow 0.6% in 2015 after contracting by 0.3% this year. The European Commission has asked France and Italy for more information regarding their 2015 budget plan. However, French President François Hollande ruled out making bigger savings than the unprecedented €21 billion already planned. France is cutting its public deficit less quickly than promised to EU partners, raising the chances that the European Commission will reject its 2015 budget and ask for amendments. Hollande's Socialist government is wary of trying to squeeze more savings out of the budget on the grounds that tougher belt-tightening could undermine a fragile economic recovery. Italy said it could cut its budget deficit slightly more than planned next year, after the European Commission request for clarification.